In each account we sense the contradictory energies of life as we know it, and in each gospel there is waywardness, an embedded uncertainty as the witnesses encounter something utterly beyond their comprehension and experience – something that nobody counted on. We like to think that the world is composed of things that we can count on. We act as if it is: after all we expect the sun to set in the evening and to rise in the morning. That seems to work for us in the macroworld that we know, where we get by with probability and predictability; but in the microworld of subatomic particles it does not. For about 100 years scientists have acknowledged that within the very structures of matter there is uncertainty – an understanding quantum theory named as the Heisenberg Uncertainty Principle – that in the world of matter there are processes and outcomes that are not fixed or predetermined and that we cannot count on. It seems a paradox: how is it that we can operate with predictability in the visible material world, but not in the invisible subatomic world? Is God in control or not? Or can we ask the question differently, perhaps something like this: is uncertainty the cost of freedom? Might God act by influencing through love rather by compulsion? Is God’s activity concealed within the hidden looseness of unfolding quantum processes? In the open structures of matter is it love that ‘loads the dice’ to create stability; bring order out of chaos; good out of evil? The dark before the resurrection holds this question. In John’s gospel the discovery of the empty tomb is imbued with a strong sense of chaos and uncertainty. So much takes place in the darkness – not just the darkness of the night but a darkness of unfaith and incomprehension. So we follow Mary Magdalene through the dark to the tomb and her discovery the stone has been rolled away from the entrance. The immediate effect is chaotic: and we follow a flurry of movements as the inner circle of Jesus’ followers are alerted and struggle to comprehend what has happened. 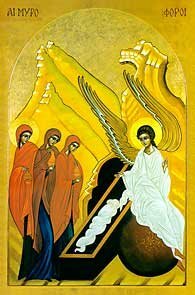 Mary remains at the tomb and, although uncomprehending and confused (after all she makes no sense of the angels or the resurrected Jesus, whom she mistakes for the gardener) there she is confronted by a new reality. Jesus names her and as she recognises him so she also discovers that she cannot relate to him as before – something has changed – and she may no longer cling to him as ‘teacher’ but now must know him as ‘The Lord’. That is what she tells the disciples, ‘I have seen the Lord’. This is not what Mary expected. She had expected to retrieve a corpse. Instead the probable and predictable have taken a different slant and the body of the man she saw die on the cross is now transformed in the risen body of The Lord. In the death and resurrection of Jesus we catch a glimpse of God working within the precariousness and vulnerability of a world where there is freedom to choose for good or ill, and where matter itself is unpredictable. The risen Lord reveals the power that sustains the universe and brings order out of chaos and good out of evil. At Easter we always bring with us our bitter knowledge of vulnerability, loss and pain; and in the Risen Christ we encounter the source and ground of all our hope.